During the 1800s and early 1900s, America was ravaged by a deadly disease known by many as the “white death” tuberculosis. This terrifying and very contagious plague, for which no cure existed, claimed entire families and sometimes entire towns. In 1900, Louisville, KY had one of the highest tuberculosis death rates in America. Built on low swampland, the area was the perfect breeding ground for disease. In 1910, a hospital was constructed on a windswept hill in southern Jefferson County designed to combat the horrific disease. The hospital quickly became overcrowded though, however with donations of money and land a new hospital was started in 1924. 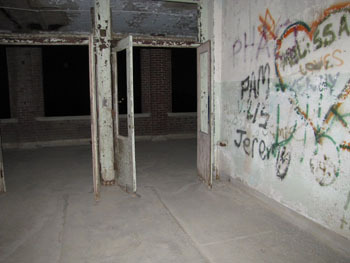 The Waverly Hills Sanatorium opened on July 26, 1910 with a two-story frame building. This building was only designed to safely accommodate 40-50 tuberculosis patients. People who were afflicted with the disease had to be isolated from the general public. It was believed the only way to cure the disease was with rest, relaxation, and plenty of fresh air, so sanatoriums were built on high hills surrounded by serene atmospheres. Tuberculosis was reaching epidemic proportions among the public in Pleasure Ridge Park, Kentucky with over a 140 cases of TB being reported in 1924. It was obvious a larger hospital was needed. The newer larger hospital which exist today opened October 17, 1926 and operated as a tuberculosis hospital until 1961. After tuberculosis was controllable, the hospital operated as a geriatrics center from 1962 to 1980 when the state closed the facility. But it seems that this massive building is still home to past residents. We began our night on the 4th floor, the floor was made up of many small patient rooms to the back side of the building and at the front where large rooms meant for multiple patients that opened onto the large balcony. Even with the century-old paint chipping for the walls, along with old furniture scattered everywhere, and rows and rows of dark doorways the mood still felt calm thanks to the moonlight coming in from the balcony. 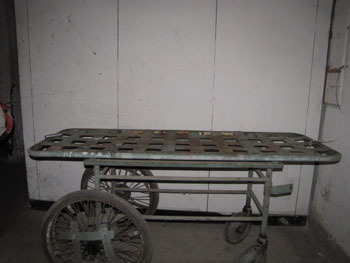 At the end of one side of the hallway was the surgical room, we tried an EVP session here but received nothing. We moved to the hallway to try a laser grid since we had heard tales of the shadow people that roam the halls. Oddly we all had the feeling all the shadows were behind us. I turned just in time to see what I believed was a shadow figure move quickly into the doorway of the surgical room we were just in. Once I pointed this out to my team the feeling of being watched seemed to fade, so we moved down the hall further. As we walked I swear out of the corner of my eye I saw more shadow figures standing, watching from the doorways we passed. A few times we stopped to investigate, but no other activity seem to happen. The building seemed to be alive with watchful eyes but the spirits when confronted were not willing to show themselves more. Next we went to the 5th floor with the infamous room 502. Legend has it that a nurse named Mary who was pregnant out of wedlock, aborted her unborn baby here then was found dead in the hallway hanging from the ceiling. Since the pipe she was hanging from was more than 10 feet in the air it was unclear how she got there, the 5th floor also has 2 large rooms on either side of the floor with rooftop balconies, and these rooms were for the mentally ill patients to one side and the children’s ward on the other side. In the children’s ward we started an EVP session. There was a ball in the center of the room that we began to past around. At times the ball seemed to move on its own, first moving in a circle pattern and then changing direction all on its own. Once the ball game didn’t seem to be working for us anymore we investigated Room 502 in an attempt to get Mary’s story straight from Mary herself. It seems though that Mary is as shy as the other spirits of Waverly and we received no known evidence. We moved to the 3rd floor and tried using a spirit board and pendulum that the spirits can use to give us yes and no responses to questions. Only moments into our session, we heard what sounded like large furniture being moved down the hallway. As we went to move toward the sounds they suddenly stopped. We found a large desk in a room that when moved made the same sound, but not being sure of its original positioning we couldn’t say honestly if it had been moved. Soon after a tour guide came to get us saying that another guide had been attacked and pushed up against a wall on the 1st floor. As other were panicking we ran to explore the floor ourselves.